Metallo. The man with the kryptonite heart. 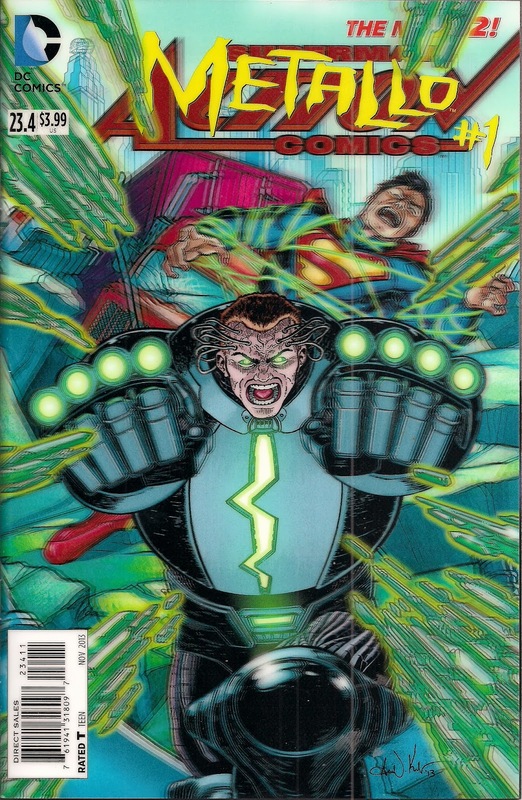 There’s not much call for him to open the traditional chest panel and let the green rays flow free this issue, as Superman is missing due to the events of Forever Evil #1. Kryptonite is important, though, kickstarting soldier John Corben after three years in a vegetative state, following his first encounter with Superman. 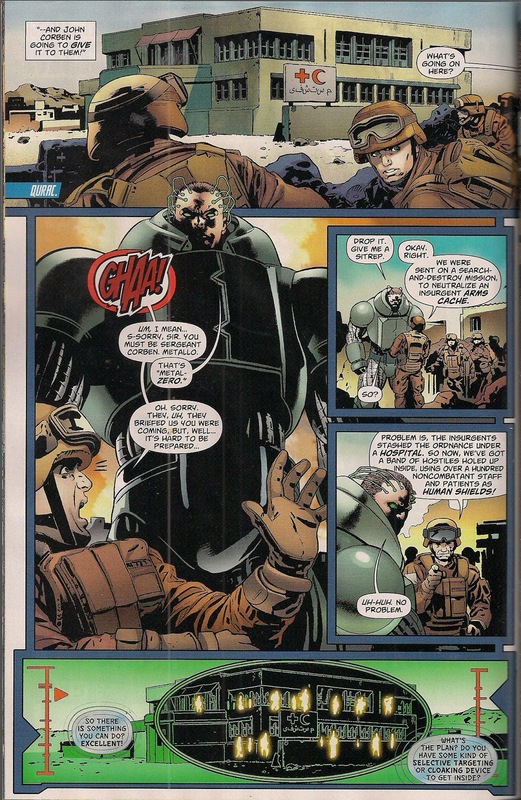 Against medical advice, General Sam Lane puts the super-suit-clad Corben – designation Metal-Zero – back in the field. But his time apart from the world has changed him, eroded his humanity. Where Corben was once a good soldier with some anger issues, now he’s a soulless thug, always taking the shortest route to mission success … even if that means innocents die. Setting his loyalty to one side, Lane resolves to put this bad dog down, attempting to blast him to smithereens above the Atlantic. But Corben survives and walks back to the United States under the sea, one slow step at a time. His eventual confrontation with his ‘betrayer’, Lane, leads to a meeting with his successor, Metal 2.0, that only one will survive. And if you’re wagering that Corben is the winner, I’m not going to bet against you. By issue’s end he’s hooked up with the Secret Society, declared John Corben dead and embraced the hated nickname of Metallo. Writer Sholly Fisch provides a well-plotted script that puts personality to the fore; he’s not concentrating on Corben alone, he’s also fleshing out Superman-hater extraordinaire Sam Lane, making him a more admirable character than usual. He’s loyal, but only to a point – he won’t let non-combatants die, and he’ll put his men before himself every time. He’s pragmatic, courageous, a good American. On the down side, he still sees daughter Lois as some kind of trophy to be handed over to a man who meets with his approval. As for Corben, he loses some of his soul but becomes a more effective villain – a cold-hearted killing machine with the strategic mind and laser focus of the career soldier. I’m really looking forward to his next trip to Metropolis, now that he hates Sam Lane as much as he abhors Lois, for rejecting him, and Superman, for putting him in a coma. Fisch gives us another compelling character in Sgt Brizuela, the man who becomes Metal 2.0. He’s not around long, but makes a great impression with his grit and goodness. The story – excellently entitled Full Metal Jacket – opens with Corben tramping the ocean floor (click on image to enlarge), with burning rage keeping him going as much as the extraterrestrial radiation within him. The flashbacks are woven in and out with elegance, until we reach the present, and Corben reaches his goal. Fisch’s partner in storytelling, artist Steve Pugh, provides exemplary stripwork; whatever emotion he’s asked to capture – seething rage, mad hope, mystified confusion – he aces it. The big battle scene between Metal-Zero and Metal 2.0 explodes off the page, while actual explosions produce perfect pyrotechnics. Which brings us to colourists Barbara Ciardo and David Curiel. Their naturalistic tones ground the book in the real world, making the big blasts of flame all the more effective. A tip of the hat, too, to letterer Taylor Esposito for military-style precision. One of the most effective compositions shows how imposing Metal-Zero is even when he’s not doing anything but arriving; the low angle and Corben’s bursting of borders conveys the notion of a presence so terrifying, even his colleagues are afraid. The 3D cover, with its ‘floating’ green kryptonite shards and flying fist, is fun, a pleasing piece of art by Aaron Kuder – writer and artist of this week’s spiffy Parasite special – and colourist Daniel Brown. All in all, a fine issue which begs two questions: 1) Why isn’t Fisch writing a Superman book regularly; and 2) what the heck happened to Metal 1.0? In my opinion, Metallo should wear his skull helmet or something to protect his brain and those wiring in the back of his head. It's not like he's Lex Luthor, he doesn't have to show off his face, and worse he's not even sporting a stylish mustache. 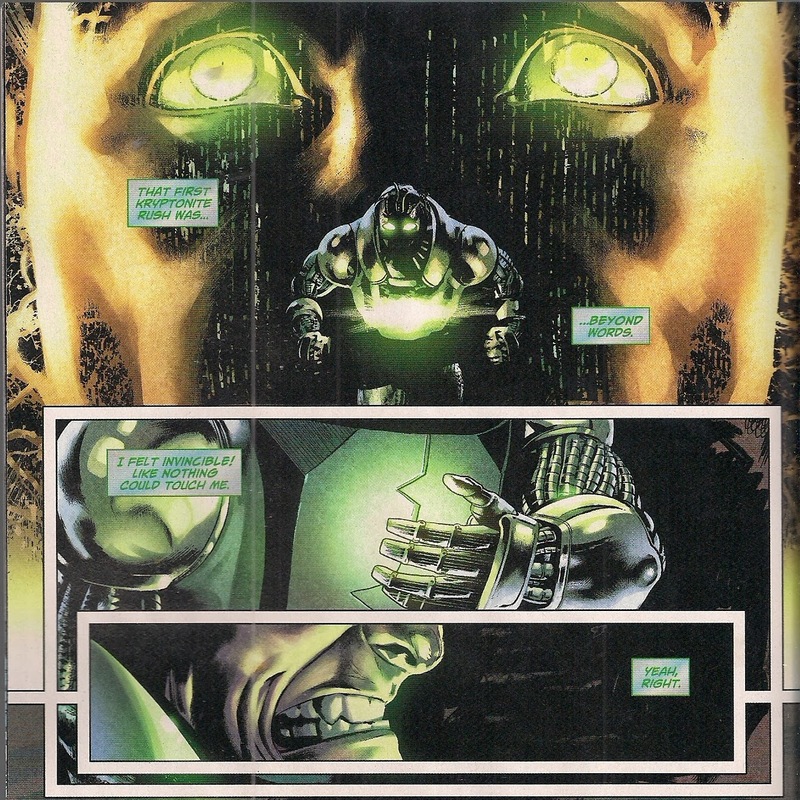 Oh Metallo, why did you have to shave it off? It'll probably never grow back now. Ta, I likely have it on DVD behind me! Hee, thanks for a great giggle. And you're spot on as regards the lack of brain protection.